Ginninderra Village in Gungahlin is one of Canberra’s earliest settlements. The Gungahlin District that surrounds it is of course much more recent, but even this ‘new’ part of Canberra has already come of age. Did you know that it has already been 25 years since the naming of the majority of suburbs that now make up Gungahlin? Gungahlin is particularly interesting because it was the first of Canberra’s town centres to be developed by the ACT Government rather than the Commonwealth. It also came at a time when planners were increasingly grappling with environmental issues to come up with sustainable development approaches. Records documenting the development of Gungahlin are ArchivesACT’s Find of the Month. William Davis, who took over Ginninderra Estate from George Palmer Snr after his death, acquired additional land in the Gungahlin district in the early 1860s. It was here that he built a new homestead called Goongarline, the name from which Gungahlin was derived. The first village for Gungahlin was called Ginninderra Village (in present day Gold Creek Village) and grew from the first Ginninderra store and post office which opened in 1859, near Ginninderra homestead. In 1884 the Ginninderra Schoolhouse and teacher’s residence was built, although the school closed in 1910. During the early 1900s Ginninderra Village was a community containing a number of businesses and amenities. In 1916 the Ginninderra Farmers’ Union disbanded and farmers left the district as it was taken over by the Federal Capital Commission (FCC). The Commonwealth Government officially gazetted the name of Gungahlin District, along with all the other districts located within the ACT, in March 1966. Aside from Ginninderra Village, the Gungahlin area was predominately a rural landscape from the mid-1820s until the 1990s. 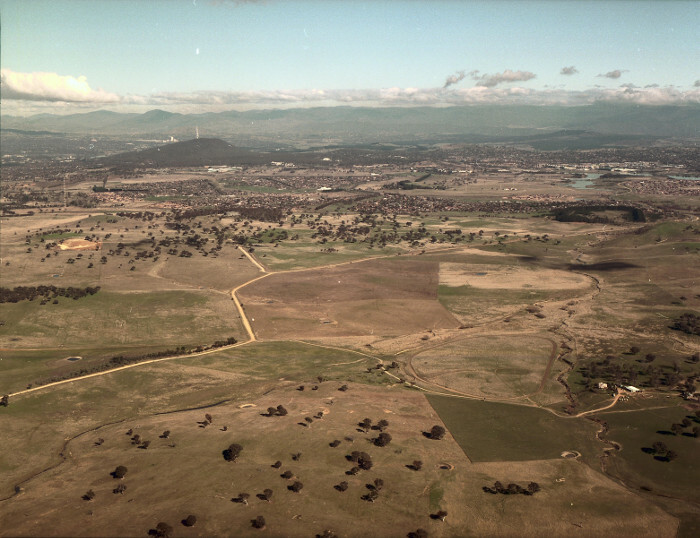 During the 1960s the National Capital Development Commission (NCDC) recognised that Canberra had reached the stage where development lay beyond the area covered by the city plan gazetted in 1925. 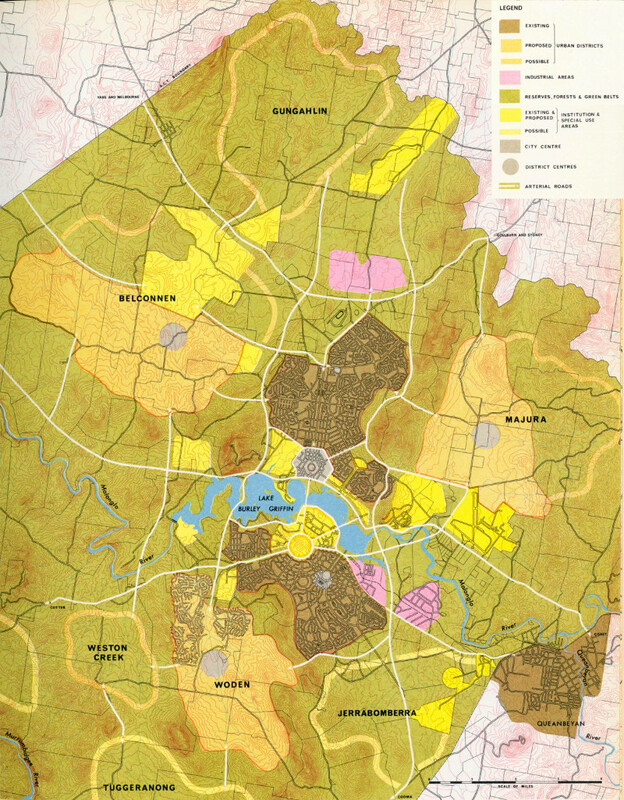 The publication A plan for the future of Canberra called for the building of a series of districts or “new towns”, each with its own employment, recreation, retail and social services, making them relatively self-contained. 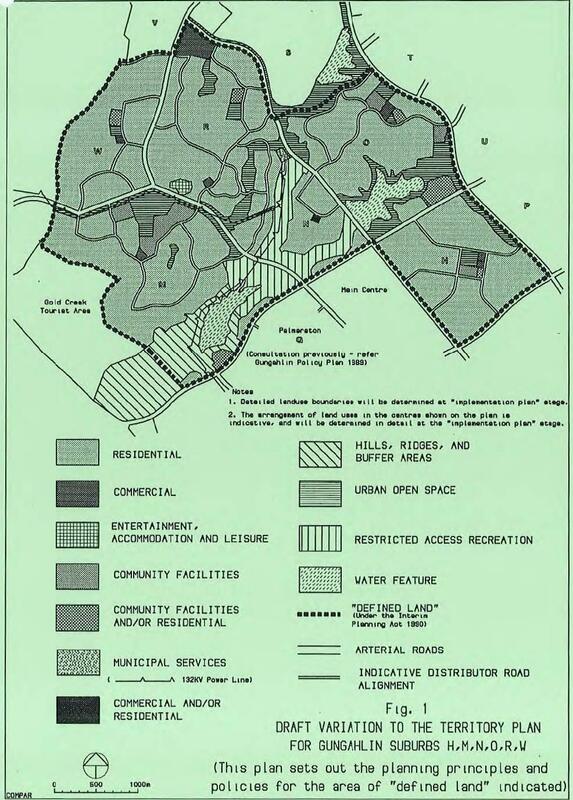 The first stages of this plan saw the construction of Woden and Belconnen, followed by Weston Creek and Tuggeranong, although a proposed Gungahlin was included in the outline plan. The initial development of urban Gungahlin began in 1975 when the industrial suburb of Mitchell was gazetted; construction started there in 1977. The NCDC’s Director of Planning, John Gilchrist, at that time declared that the new town of Gungahlin “offered a chance to build a completely different lifestyle”. While a big vision was being developed, which included the greater use of solar power in houses, the abandonment of conventional storm water drains and more efficient water usage, the serious planning for Gungahlin would not commence for at least another two years. Planning and public consultation for Gungahlin’s suburban areas did not happen until 1987, at which time the landscape was comprised of 12 rural properties. This period was also the beginning of the ACT’s transition to self-government and a separate public service. While the NCDC began planning Gungahlin, final planning and construction ultimately became the responsibility of the new ACT Government. It was during this transition phase that the Commonwealth passed the ACT (Planning and Land Management) Act 1988 . This Act abolished the NCDC and established a new national planning body, the National Capital Planning Authority (NCA), in its place. The NCA’s role would be to prepare the National Capital Plan to define the policies, aesthetic principles and any development requirements necessary to maintain and enhance the character of the National Capital. At the same time, the Act established its own planning body that would be responsible for the normal range of state-type planning and development matters. It would develop and manage a Territory Plan consistent with the National Capital Plan and set out the detailed planning, design and development conditions for all land in the ACT, except for designated National Capital areas. All this meant that Gungahlin was the first town centre development conducted by ACTPA under the new ACT Government. "In the longer term, it may be possible to cater for a substantially greater proportion of the growth of Canberra through intensification of development in already established areas. However, it is unlikely that this will completely replace the need for new land development." It was in March 1991 that the ACT Government gazetted Palmerston, the first of Gungahlin’s suburbs. In August 1991, ACTPA released Gungahlin Suburbs H, M, N, O, R, W - Draft Variation for Public Comment indicating the still to be named suburbs. ACTPA estimated the potential for 9,000 residences in the suburbs of Casey, Nicholls, Ngunnawal, Amaroo and around the Gungahlin Town Centre. ACTPA believed that this development would cater for the ACT’s housing needs for a period of at least four years. In October 1991 Chief Minister Rosemary Follett officially launched “Canberra’s fourth satellite city" of Gungahlin. As part of the launch the suburbs named were: Amaroo, Casey, Crace, Franklin, Harrison, Kenny, Kinlyside, Moncrieff, Mulanggarri, Ngunnawal, Nicholls and Taylor. 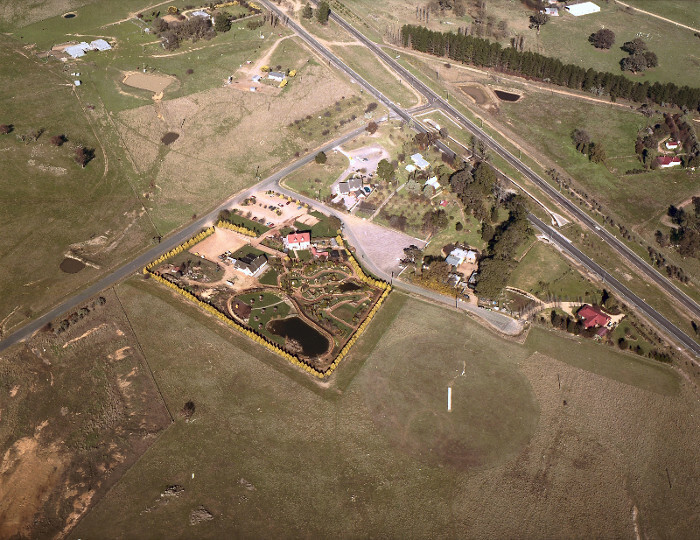 The first areas nominated to be built were sections of Nicholls and Ngunnawal in 1992, including a golf course estate. A number of community groups expressed concern about the houses facing the golf course and on the side of a hill. They felt these represented an elite development, while others were keen that the town not be planned in the same way as Tuggeranong, calling for greater energy efficiency and an increase in the availability of medium density housing. There was also concern that not enough consideration had been given to the availability of public transport. 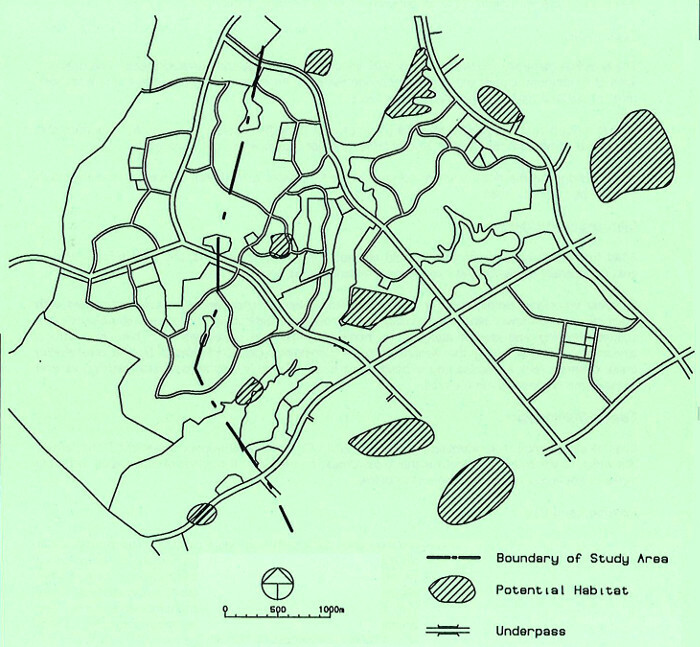 NCDC’s 1989 Gungahlin Environmental Impact Statement identified a number of significant sites and made recommendations on their future. These included conserving (retaining the site), commemorating (erecting a plaque or similar) or documenting (producing a pictorial and written record of the site). Land developers were required to conserve identified sites as part of their contract. The ACT Heritage Unit developed a set of procedures for commemorating and documenting sites that had little or no physical evidence remaining. Three quartz outcrops - two retained within housing developments by means of a control to development; the other lies within the foreshores of the Yerrabi Pond in Amaroo. A survey of aboriginal artefacts in the area of Gungahlin Pond revealed five tool-making sites. Two of the sites were protected from the construction activity but the remaining three sites were inundated. Artefacts collected from these sites were deposited with the ACT Heritage Unit. One of Gungahlin’s distinctive landscaping features is a series of ponds along Ginninderra Creek and its tributaries. ACTPA developed a water protection system to retard flooding and maintain the water quality in Lake Ginninderra by incorporating control ponds with the existing watercourses. One major difference in the design used in Gungahlin was the retention of the natural creek system rather than constructing concrete stormwater drains as found in earlier Canberra developments. These ponds also have the added bonus of providing recreation and a landscape setting for Gungahlin residents as well as a water supply for irrigation. Variations to the Territory Plan since 1993 have resulted in an increase in the area of Gungahlin’s nature reserves. This includes the area previously set aside for the suburb Kinlyside, which the ACT Government made a nature reserve in 2013. A growing awareness of environmental issues had significant influence on the development of Gungahlin, particularly the Town Centre. In June 1994, the Minister for the Environment, Land and Planning, Mr Bill Wood, convened a working party to examine a conservation strategy for the striped legless lizard. The working party released its draft report in October, making a number of recommendations in relation to the grassland habitat of the species. In particular, the committee found that “sites within the Gungahlin Town Centre and precinct contain the most significant populations of D. impar in the ACT”. Because of this preliminary finding, the Standing Committee on Planning, Development and Infrastructure decided to delay approval of the Gungahlin Town Centre as it may further endanger the population. This caused a delay in the provision of the public and commercial facilities normally associated with a Canberra Town Centre. By mid-1995, the Canberra Times reported that Gungahlin residents were Canberra’s unhappiest due to the lack of available facilities. The issue was ultimately resolved in December 1995 when the ACT Legislative Assembly approved “the resiting of the town centre to cater for the colony [of lizards].” Construction of the Town Centre finally began in early 1996. Construction of Gungahlin’s infrastructure began in 1991. In July 1992, the successful development tenderer, Landco Pty Ltd, proceeded to create Nicholls No. 1 Estate. By this time, Palmerston was well advanced, with some roads completed and housing construction started. In March 1992, Four Seasons Homes completed the first new house in Palmerston. At this time, Gungahlin’s population was only 389 residents. As Gungahlin has matured, it has become one of Australia’s fastest growing regions . By 1996, Gungahlin had around 4,500 dwellings for its 12,000 residents. This had increased to 17,648 dwellings for 47,303 people by the 2011 census. By 2014 Gungahlin’s population was over 61,000. Today Gungahlin has 15 suburbs, either completed or under construction, with development yet to start in two the two additional suburbs of Taylor and Jacka. The development of Gungahlin represents some key changes to the way planning was being done in Canberra. The ACT Government was able to take control of its own development agenda. The new ACTPA continued the growing emphasis on retaining natural and heritage landscapes and finding ways to as far as possible protect the environment. Town planning was also recognising that ACT land was not infinite, and greater housing density would be required to meet long-term needs. In bringing all of these elements together Gungahlin has grown to be thriving community and a much loved home, both to people and to legless lizards. The future Canberra : a long range plan for land use and civic design / The National Capital Development Commission. Canberra : Commonwealth Government Printer, 1964. 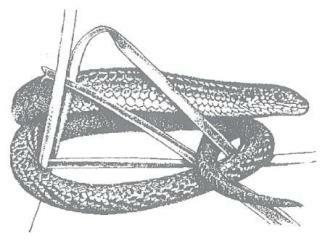 Draft conservation strategy for the striped legless lizard Delma impar in the A.C.T. : a report to the Minister for the Environment, Land and Planning / prepared by a Working Party convened by the Minister for the Environment, Land and Planning. [Canberra] : [The Working Party], 1994. A Short History of Gungahlin / Canberra Archaeological Society Inc; Helen Cooke. Canberra : Canberra Archaeological Society, 2010.